There has been so much excitement all over the country with the football playoffs and the long-waited event of the year, the Super Bowl. We love watching The Super Bowl together as a family and I go all out with yummy game food and drinks. I have been playing around with some better-for-you recipe ideas and wanted to share one of them with you. Of course, a party isn't a party without the deviled eggs! I can't think of a more simple and delicious finger food, and I always include them on the menu. I came up with a tasty version for our upcoming Super Bowl party that only requires three ingredients. Can it get any more simple than that? 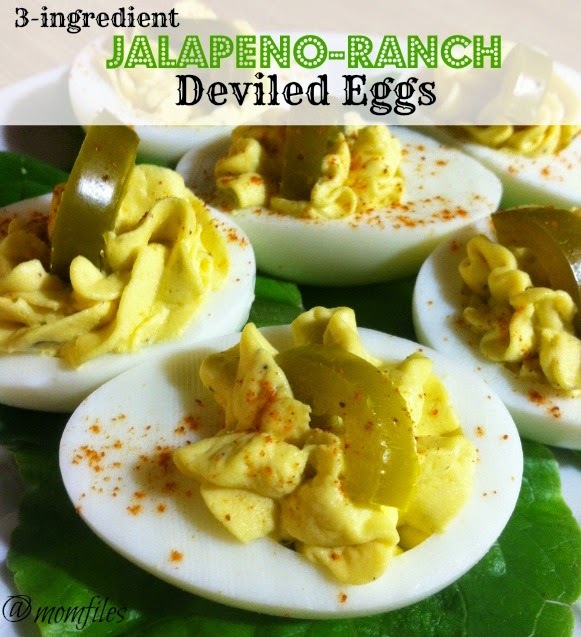 These jalapeno-ranch deviled eggs are sure to please your guests. All you have to do is separate your hard-boiled yolks in a medium size bowl and mash them finely with a fork. You then add the desired amount of Naturally Fresh Classic Ranch dressing until you reach the correct consistency you are looking for. At this point, you can add a little cracked pepper to taste if you like. Next step is to simple scoop your egg yolk mixture into you egg whites or pipe it in using a large star tip like I did. Add a half of a jalapeno ring on the top and sprinkle with paprika to make them look fancy. That's it! 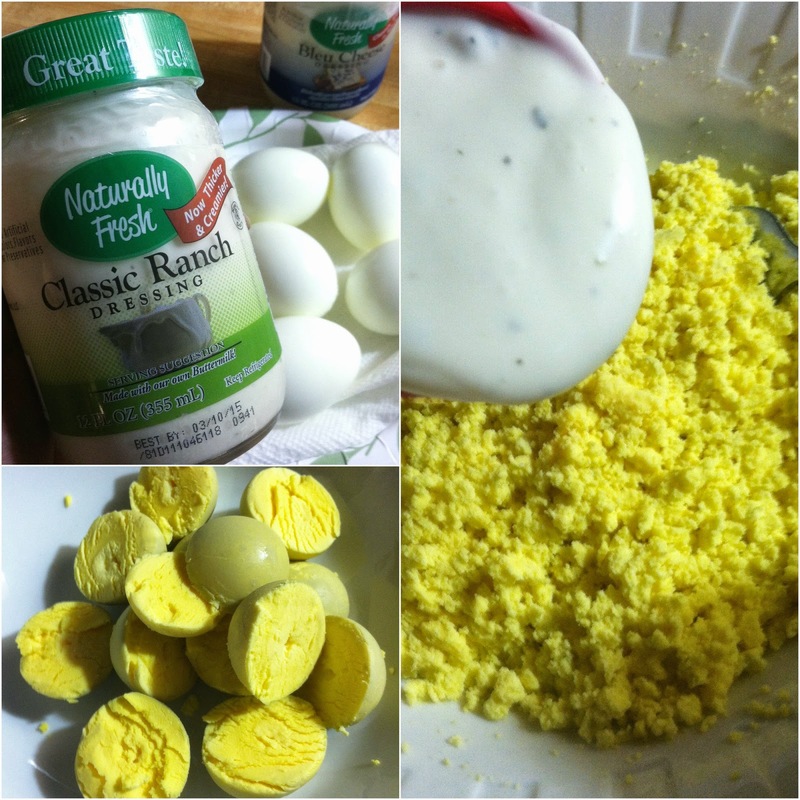 So super simple and you can even use the Light Ranch if you want to cut out some extra calories. Naturally Fresh makes their ranch dressing with their very own buttermilk and the Lite Ranch is made with their nonfat buttermilk (half the calories of the original). Naturally Fresh is a line of high-quality, homemade-tasting salad dressings and dips with no artificial flavors, colors or preservatives. These dressing and dips are always sold in the refrigerated section of your grocery stores because they don't have any artificial flavors or preservatives. Naturally Fresh does not use MSG either. You really can taste the difference in these products. You really can't go wrong with wholesome ingredients packed with flavor. Find Naturally Fresh products at most Publix or Kroger stores and you can also find other locations using the free mobile app. Their website offers plenty of recipes too! This giveaway is open to US Residents only and will end on January 26, 2015. Winners will be contacted via email to claim prize. Mom Files is NOT responsible for any lost or stolen prizes. Good luck! I want to try the Poppyseed dressing! I would like to try the Classic Ginger dressing. I bet it's delicious. I tried the ranch, but I'd really like to try the poppyseed.